Picture from Trailtrekker : In the words of the Rolling Stones "Gimme Shelter"
Picture: In the words of the Rolling Stones "Gimme Shelter"
Fionn Mac Cumhaill hunted on this very hill and the even greater legend, Cuchullain himself got his name in that famous battle with the hound on it's western flanks. I have walked this mountain in all conditions and at all different times of day and night and it still keeps drawing me back. I even forgave it after a 10km night trek in thick fog, with badly blistered feet! So, when the snow landed, I wanted to go out and taste it, but given that I was walking on my own I wanted to tackle a mountain that I was familiar with. I also wanted to take my favourite route, approaching from north. I would normally park the car at the old Killeavy churchyard at J040 221 E, this 6th century site is worth a look, as is the trek up to Naomh Monnina's well on the eastern flanks of Gullion behind it. On this day I chanced getting the car to the reopened viewpoint car park at J 032 232 F, which I just about managed! From here you follow the quiet Ballard road up to the gate at J 026 230 C. It faces a white washed cottage and you turn left on to the open mountain side to the let the real walk begin! The route is way marked the whole way to the northern summit cairn by metal arrows and a few yellow arrows painted on rocks! In good weather this provides little navigational challenge if you have your wits about you and stick to the track. On this snowy day it was easy to follow until about the last 70 metres of ascent, when the conditions became significantly more challenging and the task of navigating really began. 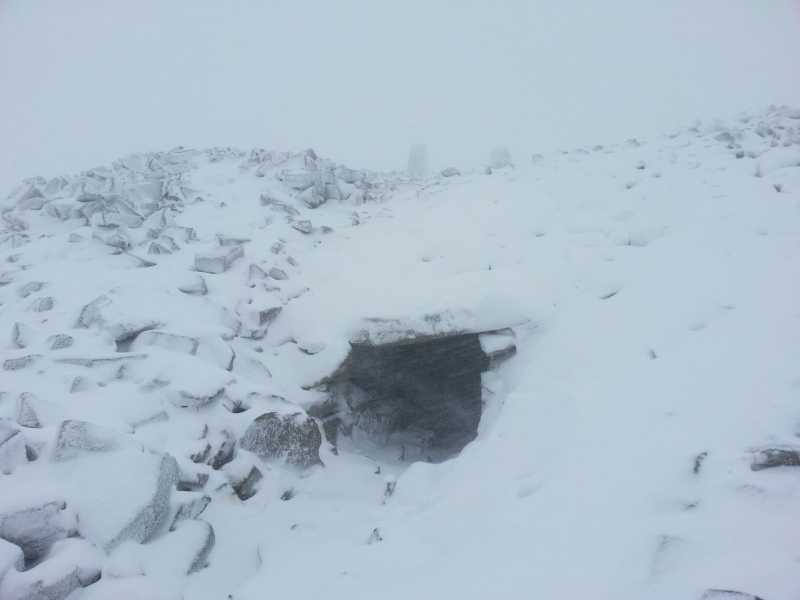 On reaching the northern cairn, the challenge was not over though, with very limited visibility my big fear on the summit plateau was getting closer to Cailleach Beara's Lough than I would like to! Is it an Irish thing to repute that nearly every lough is bottomless! I did at one point get turned around and ended up heading back towards this lake which I had passed already, but being aware that the wind should not be on my back, I corrected my error and made good progress to the main summit from here.